Very elegant post! Love those roses. Gorgeous settings and great ideas. Thanks for sharing. I love this gorgeous pattern, pretty obvious to family and friends since I own the entire set and many serving pieces. Thanks for featuring it today. Old Country Roses is the best selling china & dinnerware pattern in history...despite only being designed in 1962. Pretty cool! Not so nice now it's made in Indonesia, but yours is English made. I love all your roses. Gorgeous! Nice to meet you! Beautiful! And so elegant. Your tea cup is one of the older Old Country Rose patterns, as I don't think they are made in England anymore. What a treasure. Betty, your teacup under the cloche is so lovely. I love OCR too and it was my Daddy's favourite. Love the roses and they lend such a beautiful touch to your tea setting. Thank you for linking up with Tea Time today. It's always a real pleasure to have you join me. Wishing you a delightful day. Who doesn't love OCR! Your cup looks beautiful in the cloche. I have been wanting a cloche for a while now and seeing your pictures I think I will look more seriously for one. Your photos are all gorgeous! Hi Betty. So beautiful and the roses are gorgeous! Wow! I adore that cloché of yours. The roses on the tea cup are pretty but your roses are splendid. Very pretty. Thanks for joining wow. This is truly just the prettiest vision of lovliness! 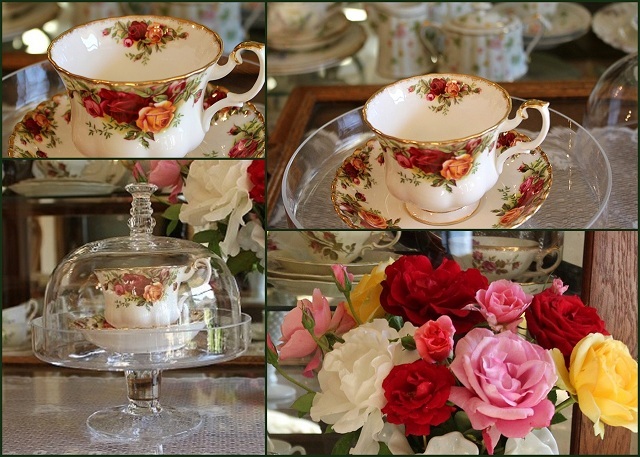 The Old Country Roses china and teacup and the real roses along side your heavenly vignettes and cloches.., A visual masterpiece of tablescaping artistry to be sure! Your flowers match the flowers in your beautiful china perfectly. Beautiful! You have the most beautiful roses and they are lovely in your milk glass vase! Found you via Savvy Southern Style and look forward to following your blog! This display is nothing short of stunning. My mother has an entire collection of this and I drool over it each time I am home. This made me smile and I just love your photos!!!! The tea cup pattern is one of the prettiest I've seen, how nice that you found it for your cloche! Your garden must be breathtaking! Thanks for sharing part of it with us!